Cutting the ribbon on the new courts. The USTA and the New Haven Open at Yale presented by First Niagara announced the refurbishment of tennis courts at Wilbur Cross High School in New Haven, Conn., as a part of the USTA’s Olympus US Open Series Legacy program. The program is designed to leave a long lasting impact in the communities which host Olympus US Open Series tournaments. Two courts at Wilbur Cross High School have been converted into six permanent 36-foot 10 and Under Tennis courts. Six other courts have blended lines on the courts to make them 60-foot 10 and Under Tennis courts. These conversions will further develop 10 and Under Tennis and youth tennis in the city. The courts are currently used for local kids and adult clinics and programming, high school tennis matches, and recreational play. The courts were unveiled today at a ceremony with New Haven Mayor John DeStefano, Jr. and kids from JUNTA, the oldest Latino, community-based non-profit organization in New Haven, and New Haven Youth Tennis & Education. 2010 US Open National Playoffs men’s champion Blake Strode, who will attempt to defend his title in New Haven, August 18-21, and Lena Litvak, who will be playing in the US Open National Playoffs – Women’s Championship, also took part. Strode and Litvak both won the US Open National Playoffs USTA New England Sectional Qualifying Tournament in May. "In addition to being a longtime showcase for pro tennis, New Haven has a rich tennis history at the grassroots level," said Kurt Kamperman, USTA Chief Executive, Community Tennis. "We hope this investment in 10 and Under Tennis courts can help grow the game and leave an impact on the local community." 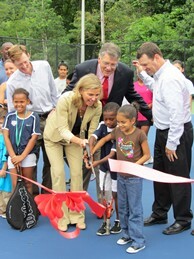 "One of the most effective investments we can make as a community is ensuring our children have safe, positive places to learn and play," said New Haven Mayor John DeStefano, Jr. "The USTA’s Olympus US Open Series Legacy program does just that and I want to extend my thanks to the USTA and the New Haven Open for the tennis court improvements here at Wilbur Cross High School." "The New Haven Open at Yale has always been committed to leveraging the tournament as a vehicle to engage the community, especially its youth, in creating a healthy lifestyle both physically and educationally," said New Haven Open Tournament Director Anne Worcester. "Thanks to the USTA, leaving a Legacy at the Wilbur Cross courts, where community and schools meet for 'fun, fitness and friendships,' is another testament of our commitment to bettering lives in our community." The total cost of this refurbishment is $55,000. With an Olympus US Open Series Legacy, USTA Professional and Community tennis partner to leave a lasting impression in communities where an Olympus US Open Series event is held. The New Haven Open at Yale presented by First Niagara, the last women’s tournament of the Olympus US Open Series, will take place at Connecticut Tennis Center at Yale in New Haven, August 18-27.